All the digi designs are from my friend Miriam Lima, you can find them on littledreamerdesigns.com. You are friendly, down to earth, and fairly conservative. You are true to your friends and your upbringing. Change is hard for you. But beneath your old fashioned attitude, you are expressive and artistic in your own way. Very few people can express pain and pleasure as eloquently as you can. I had fun last night playing with a new software package I received yesterday called My Memories Suite by Polaroid. It was so much fun to browse through their fun templates and I loved the coordinating embellishments (paper clips, stitching) that I could add and move around. I've had several friends and family ask me how they could create scrapbooks on their computers but were too freaked out to do Photoshop and build things from scratch...this software is PERFECT!! If you're interested in learning more, check out their website here! 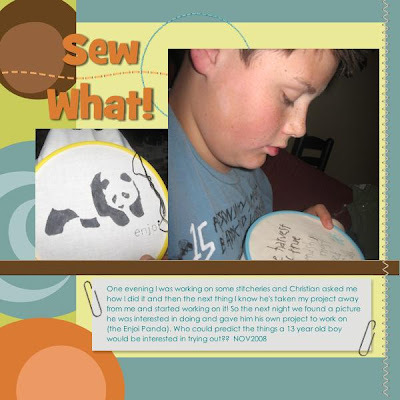 Now let's talk about the layout...YES, Christian is sewing (grin)! He was so interested in what I was working on that I showed him how to do it and then he TOOK my project and stitched some letters until he got stuck. So to get my project back I helped him find one of his own. We're going to frame it when he's done. I like that it gives him something to do while he watches TV that doesn't mess up my family room like LEGOS do. 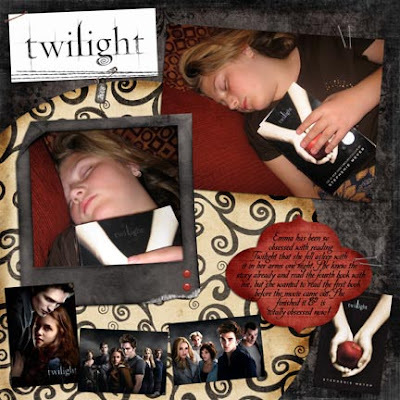 Well as most of you may already know the Twilight era has arrived and fans ranging in age from 10 to 90 are crazy about Stephenie Meyer and her series of vampire books. At first many of my friends tried to convince me to read these, but you see I'm not a reader at all. I'm on the computer all the time. So at the complete and utter peer pressure of some neighbors I rented the first two books on CD and listened to them while I worked. Much to my surprise I enjoyed them...except for the fact Bella thinks she's madly in love and wants to spend eternity with Edward and she's ONLY 17. If I thought that at 17 I'd be married to a guy named Scott and probably a navy wife somewhere halfway around the world...but then again he wasn't a handsome VAMPIRE either. 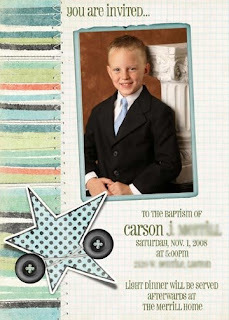 Recently I was asked to help out a gal and create a 5x7" baptism invitation for her son Carson. I got a little carried away and ended up created four for her to choose from. Please forgive the blurring on the name and omission on the address...people deserve their privacy (wink). All four invitation were created using my dear friend Kristi's designs (ShabbyPrincess.com). They selected the last invite, but my favorite was the first.